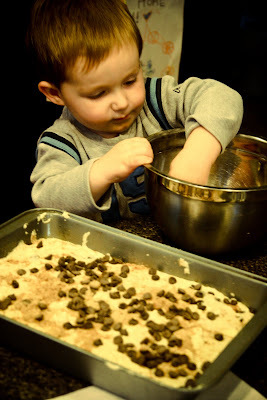 This morning Kai and I got busy in the kitchen. I decided to do some baking and cooking to freeze. I know, it may seem early but whatever, I had some energy this morning. 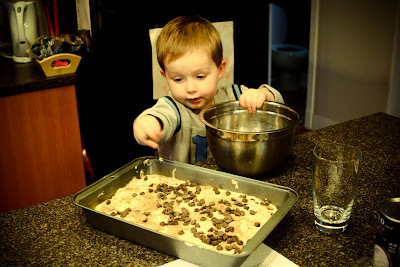 Kai helped making the Ponderosa cake by peeling the bananas and adding the chocolate chips. He said he was sprinkling freckles:) I have a roast in the slow cooker for dinner tonight and I'm about to start a curry dish to put in the freezer. Well, better fold some laundry and get on that curry dish! `The Office' tonight...woohoo! Yahoo the Office, I love Thursdays because I know I have some evening laughs to look forward to. 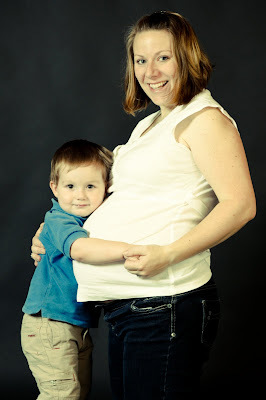 Kai looks great hugging your tummy :) hopefully he is a good big brother. oh & baking on such a rainy/windy day, lucky!